Let’s face it, there is nothing quite as refreshing as being outdoors; be it fishing, wind surfing, camping, you name it. 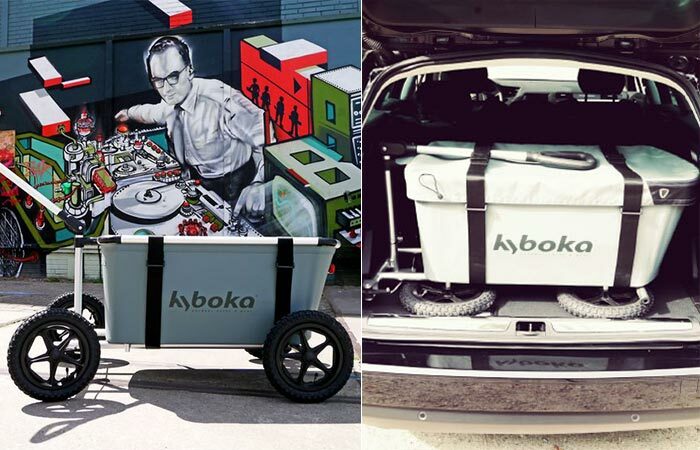 However, getting all your equipment from A to B can sometimes be a major hindrance and Kyboka, a multi-purpose outdoor cart, is the answer to that problem. The Kyboka was designed with the outdoorsman in mind; it’s tough, versatile, functional and engineered to tackle anything that you can throw at it. The Kyboka is rugged enough to be used on sand, rocks, grass and anything else that you can think of. To save on storage space, the Kyboka folds up so that you can take it anywhere. The Kyboka is unique in the fact that it is extremely portable and versatile. It was engineered to fold up completely so that you can take it wherever you are going and to save space while storing it since it only measures 41.73” x 24.8” x 7.48”. For ease-of-use, the Kyboka will take no more than 3 minutes to set up and it can even be stored in different ways for different tasks; such as the wheels folding in while the tub is still set up to carry goods in your car etc. When it is completely set up, the Kyboka measures in at 47.24” x 25.59” x 21.65” and has a carrying capacity of 50 kg (110 lbs). Check out the video below. 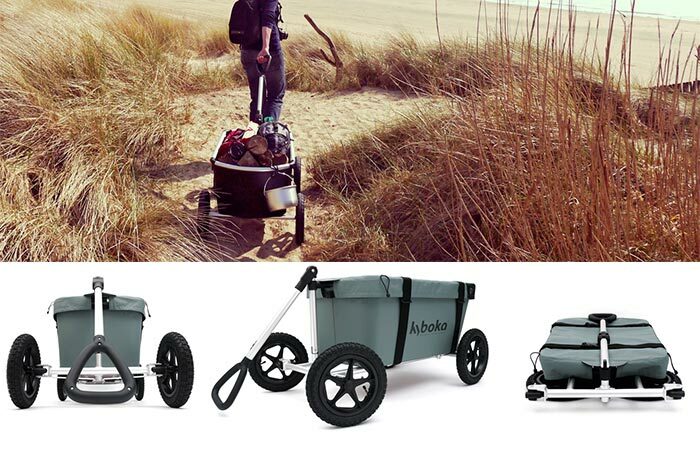 The Kyboka has a respectable carrying capacity of 50 kg (110 lbs) and the wheels can fold in while the tub is still up so that you can easily carry goods in your car. The Kyboka comes with a cover as well as straps; depending on your needs, you can either close it or leave it open while the straps allow you to securely fasten all of your goods and equipment. Because the Kyboka was designed as an all-terrain carry vehicle, ergonomics and comfort was a huge part in the development and this is why they designed the handle to be able to turn 360-degrees. This means that no matter where you go, you’ll never have sore wrists or shoulder because the Kyboka will adapt to your current position. So, if you were always struggling to get your stuff around while chilling outdoors, the Kyboka is definitely for you. You can purchase the Kyboka in Standard form, Complete and Pitch Black.